This week I’m talking with Susan Shenk, an occupational therapist, the founder of Shift Your Thinking LD, the CEO of Technology & Tools for Kids, and the author of Beyond OK: From Invisible to Invincible. Susan has worked as an Occupational Therapist in the school setting for twenty years, where she watched and looked at how learning was viewed and what was missing when it came to supporting kids who were learning differently. One of Susan’s passion is helping parents, educators, and other occupational therapists understand how to tap into the power of technology in order to help kids develop their fledgling skills. In our conversation, we’ll hear how Susan’s own journey of growing up with an undiagnosed learning difference influences her work today, and get her insights on how technology can be best used to support kids who are different learners. About Susan: Susan Schenk is a mom of three kids, a wife, and an occupational therapist. 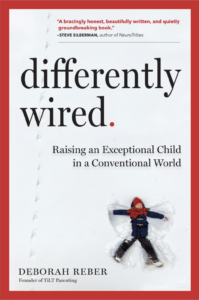 In her book, Beyond Ok: From Invisible to Invincible, she offers an insider’s look at learning differences as a child, a parent, and a professional in the school system. Her OT business Technology & Tools For Kids offers consultation to help parents support their child that learns differently. She is the co-founder of Shift Your Thinking LD (Toronto, Ontario) which is a nonprofit organization that offers parents and professionals insight into the world of learning differently and strategies that support all areas of their life (learning, physical, and emotional).